Terrence R. Bethune, Esq. is the founding partner of The Bethune Law Firm. 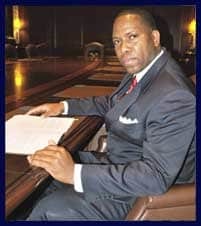 He was admitted into the practice of law in 1997 for the State of Georgia and devotes 100% of his law firm’s practice to representing victims who have been killed or seriously injured by the negligence of others in accidents involving wrongful deaths, tractor-trailers, cars or pedestrians, motorcycles or bikes, work related, slip and falls and premises liability. Mr. Bethune has represented thousands of highly satisfied clients and has conducted numerous jury trials throughout Georgia involving death and non-death cases, recovering millions of dollars for accident victims and/or their families within the last 12 months alone. He is highly experienced in matters involving death, paralysis, amputations, broken bones, surgeries, herniated disc, head injuries, and neck, back and leg injuries and can help to possibly get you the maximum compensation allowed under the law for hospital/medical bills, loss of wages from missed work days, and pain and suffering compensation caused by negligent or drunk drivers. J.D., John Marshall Law School, Atlanta, Georgia. B.A., North Carolina A&T State University, Greensboro, NC. Beulah Baptist Church, Decatur, Georgia.